Keen to improve its casting impregnation process and reduce the associated environmental impact and costs, Honeywell approached Ultraseal to assess its existing system and make recommendations for improvements. The solution was conversion to Ultraseal recycling technology, which has resulted in substantial savings in sealant consumption and water usage, reduced water treatment and effluent disposal costs and improved productivity. As a major manufacturer of combustion control valves, Honeywell – Environmental and Combustion Controls NA has been championing a vertical integration approach to its manufacturing process for many years. 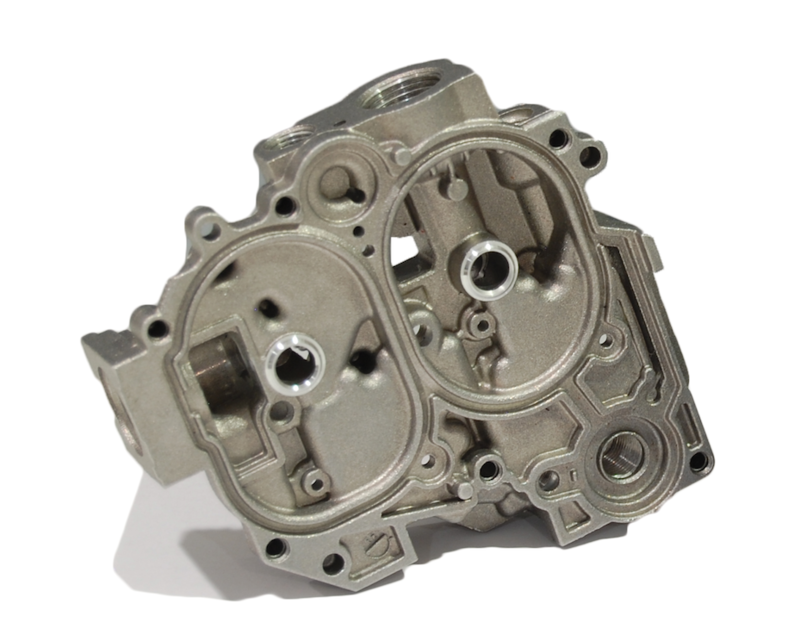 Producing millions of valves per year, Honeywell carries out all machining and secondary operations in-house, operating eight die-casting machines (ranging between 500 – 945 US tons) which supply 100% of the company’s die-casting requirements. For more than 18 years, the facility in Dublin, CA has been sealing porous castings using an automated impregnation machine that processes more than 2,000 castings per day. As a global brand that leads the way in innovation across a wide range of industries, Honeywell has a corporate focus on improving productivity and efficiency and a commitment to reducing costs and the inefficient use of resources. The plant’s casting impregnation process, unchanged for many years, had ongoing issues with post impregnation product quality, which reduced productivity, and with the environmental costs associated with the process. To find a solution to these issues that met Honeywell’s improvement goals, Honeywell called on Ultraseal’s experienced engineers to conduct a site survey to understand their component impregnation needs, current systems and processes. Analysing the manufacturing system data, the Ultraseal team found the impregnation system was consuming about 200 gallons of sealant per month and 1,000 gallons of water per day on the wash tank alone. Due to restrictions on discharging, the contaminated process water was treated on site, then filtered. An evaporation system was also required, adding an additional effluent treatment cost of $0.21 per gallon of process water. In addition to the high volumes of water and sealant usage, Honeywell was experiencing issues with parts becoming sticky following impregnation. This meant they were having to use even more fresh water in the tanks for cleaning, which increased process downtime and reduced productivity. At this point in time, the system was only capable of processing five carriers per shift. Following a full system review and assessment, converting the conventional impregnation system to Ultraseal recycling technology and using Ultraseal Rexeal 100 recycling sealant was recommended. 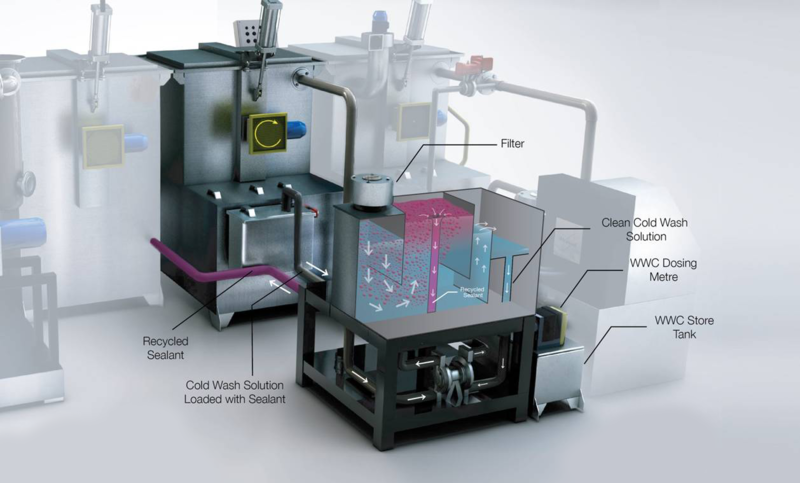 Recovery System (SRS) provides cost effective processing while avoiding the significant challenge of process chemical effluent treatment costs, as well as eliminating solids disposal and greatly reducing the associated evaporation costs. specifications and improve component washing, eliminating the previous post impregnation problems with “sticky” components. This meant Honeywell could also eliminate one of its three wash tanks which reduced the time required for processing. Ultraseal engineers were able to reuse most of the existing equipment in the system conversion and also updated the programs in the PLC and CNC controllers. The PLC updates led to much faster processing cycle times, made possible by the faster gel time and improved process stability of Ultraseal Rexeal 100 recycling sealant. The conversion work was completed within a two-week window. Since implementing the system in 2016, Honeywell has benefitted from significant cost savings, productivity improvements and environmental benefits. Reduced water consumption: Most significantly, the business has seen a 98% reduction in water usage generating a cost saving valued at $172,000 per year. Reduced cycle times and processing costs: The cycle time reduced from 110 minutes to 40 minutes per carrier and the number of carriers processed per shift has increased from five to nine. This has reduced the impregnation cost per part by 37%. Labor cost savings from improved productivity: Increase in process productivity meant the labor content was reduced by about 50%, allowing for the elimination of two shifts and the redeployment of operators elsewhere on site. This has delivered a further departmental cost saving of $100,000 per year. Reduced wastewater treatment costs: By eliminating the need to treat waste offline, the cost for flocculation chemicals, filter paper, trucking etc. were eliminated completely, saving an additional $70,000 annually. Sub-contract cost savings: Because the system no longer has sealant building up on process equipment, a further savings of $16,000 per year was realized by eliminating the need for an outside contractor to clean the process tanks twice a year. Overall, conversion to Ultraseal recycling technology has delivered Honeywell consolidated cost savings of $19,000 per month while also significantly improving productivity and environmental performance. This best practice approach to die-casting impregnation highlights the importance of optimizing the choice of component impregnation strategy. It also reinforces the importance of working with a partner that has the process knowledge, technology and support to deliver a solution customized to meet your exact needs, helping manufacturers meet the challenge to increase productivity and quality while reducing costs.